A piece of British history from Robert Falcon Scott’s 1910-13 “Terra Nova” Expedition is available in our upcoming March stamp sale. Pieced together by collector Charles Stevens, lot 162 tells Scott’s fascinating tale using incredible first-hand pieces of postal history. The first postcard in the collection, from well-known philatelist and official agent of both the Shackleton and Scott expeditions J.J. Kinsey, is an example of a typical ‘Kinsey multiple usage.’ It bears a New Zealand 1d booklet stamp tied by a date of 1st April 1904, the date at which the “Discovery” expedition returned to Lyttleton, the port of Christchurch. The 1901-4 “Discovery” expedition launched the Antarctic careers of Scott and Shackleton and marked the first exploration of the Antarctic region in sixty years, setting a precedent for later polar exploration. 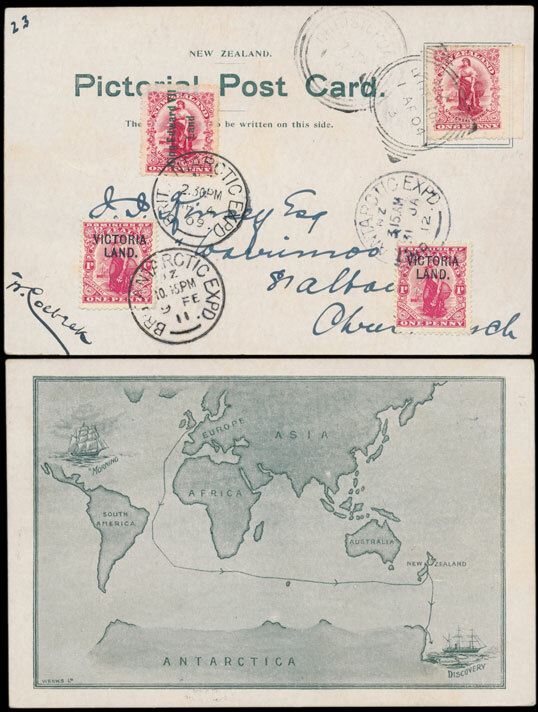 Additional to the 1904 stamp, a “King Edward VII Land” 1d overprint, from the 1907-09 “Nimrod” expedition led by Captain Ernest Shackleton, was attached to Kinsey’s postcard. The King Edward VII Land overprints were both an exercise in publicity and financial intuitiveness, with almost 24,000 1d rose-carmine “Universal” stamps supplied for use during the voyage. The journey was cut short by severe weather conditions and a shortage of supplies before Shackleton could reach the South Pole and a brass cylinder containing a Union Jack, documents and examples of the overprinted stamps were buried in the ice before the crew returned home. The postmark tying the KE VII Land stamp is dated March 4th 1909, the day “Nimrod” returned to Britain, the final day of correspondence for the 1909 expedition. The final two stamps on the souvenir card are overprinted “Victoria Land” and mark two separate moments during Scott’s expedition to the South Pole. The first is dated 9th February 1911 and represents the date the first mail was carried back to New Zealand by the “Terra Nova”. The second is cancelled 31st January 1912 – five days before Scott reached the South Pole – in likely anticipation of the arrival of the “Terra Nova” on a relief voyage. Kinsey’s postcard is an excellent article from a spectacular period in British history, representing three separate expeditions on a single postcard. 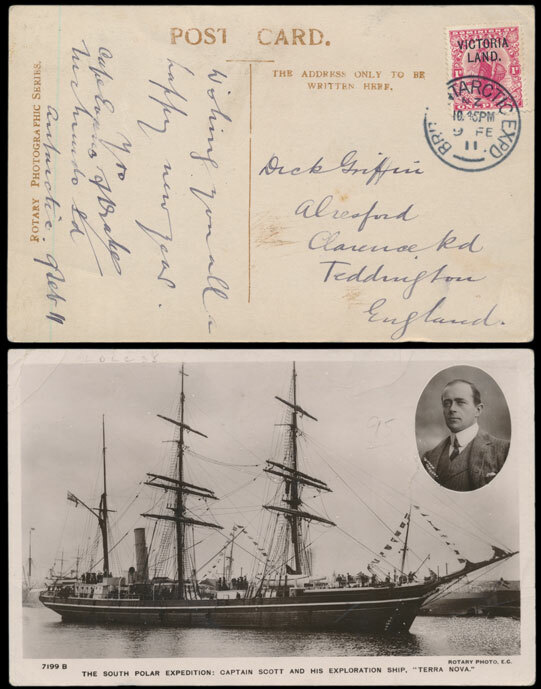 The second postcard in the collection is from James Paton, a member of the crew of the 1910 – 13 expedition and again uses a “Victoria Land” 1d overprint dated 9th February 1911. Paton documents the arrival of Scott’s ship in Antarctica on January 4th 1911 and the establishment of the main base “Cape Evans”. He writes of the discovery of Scott’s Norwegian rival explorer Roal Amundsen’s ship in King Edward VII Land and the “Terra Nova’s” return to Cape Evans to notify Scott of Amundsen’s presence. Amundsen would later lead his men to victory in the race to the South Pole – and ultimately lead them to safety, something Scott was unfortunately unable to do. 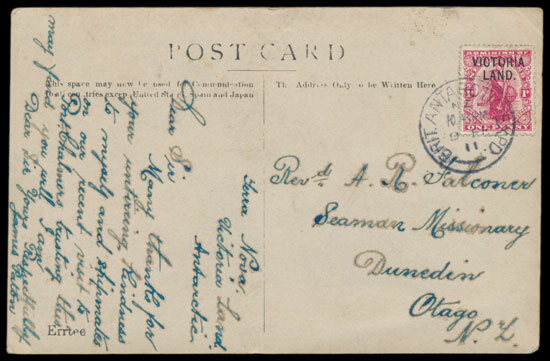 The third postcard, from expedition secretary and Assistant Postmaster Francis Drake, represents the first correspondence to reach the UK from Scott’s journey. Dated 9th February 1911 it is again franked with the New Zealand 1d stamp overprinted “Victoria Land” and cancelled with the expedition postmark. The postcard itself depicts the “Terra Nova” ship and Captain Scott. The remainder of the collection consists of 1930’s-1960’s holiday cards (largely from the UK) sent by close relatives of crew members Captain Lawrence ‘Titus’ Oates and Commander Edward Evans, accompanied by biographies of the two men. 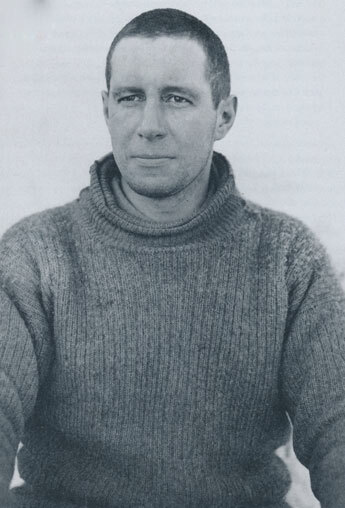 Commander Evans who had previously intended to lead his own expedition to the pole had transferred his funding and support to Scott’s plans in order to directly compete with Shackleton who he considered a rival – in return Scott was to make Evans second-in-command despite neither man particularly seeing eye to eye. 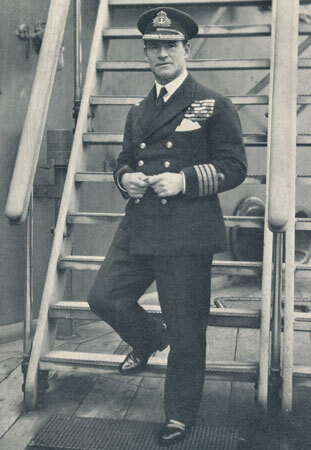 Evans was to struggle in the Antarctic conditions and suffered from physical exhaustion and scurvy due to his refusal to indulge in seal meat, this led to Scott not selecting him for the final push and Evans’ early return home. According to Scott’s diary as Oates left the tent he stated, “I am just going outside and may be some time.” He had made the ultimate sacrifice, full well knowing the fate that awaited him and the subsequent burden he was lifting from the shoulders of Scott and his men. Lot 162 offers an incredibly intriguing personal insight into one of the most significant expeditions of the 20th century. If you would like the chance to own this piece of British history you can place a bid on our website where you can also view our auction catalogue for the March 7th sale. Visit our Facebook and Twitter for updates on all our auction news.